Grants include funding to attend Annual Conference, earn CAE/CMP certifications, and special grants for communication staffers, Young Professionals, Small Staff, Under-Represented Diverse Groups and one specifically for a non-member (tell your friends!). Thanks to our generous corporate partners and member contributions, we’ve awarded 29 grants totaling $16,630 for professional development funding. Thank you to all our contributors that make this possible. One of the primary purposes of the Florida Society of Association Executives Foundation is to encourage member professional development and certification through financial support. 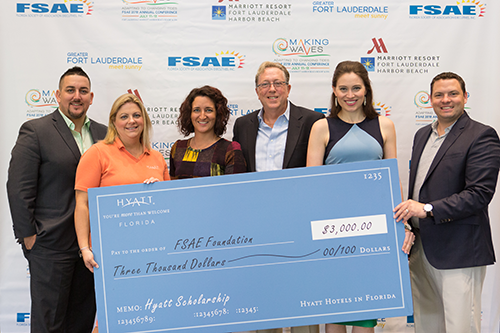 The FSAE Foundation has provided awards for many years to FSAE members through the generosity of Hilton Worldwide, Hyatt Hotels in Florida, Marriott International Hotel & Resorts of Florida, MemberClicks, Naylor Association Solutions, the contributions of FSAE members, and other supporters. 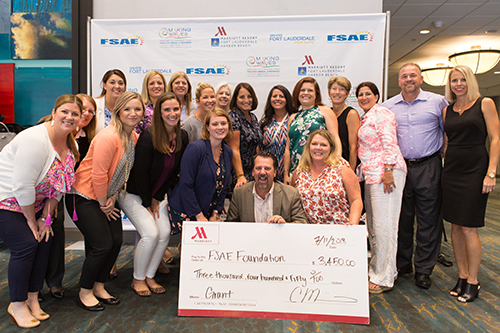 Since 2002, the Foundation has awarded 290 grants totaling $172,985 for members to attend educational conferences or earn their CAE/CMP designations. 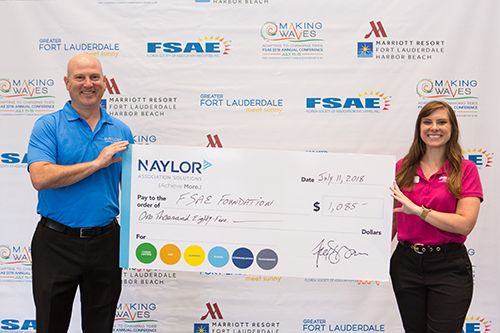 Over $262,700 has been used to underwrite speakers and education at the FSAE Annual Conference and over $299,000 has been used to implement Foundation initiatives including industry reports and surveys. This Grant is designed to assist an FSAE Association Executive Member in gaining professional development throughout the year at all FSAE Educational Programs (except Annual Conference). The award will support the recipient in covering the cost of registration for up to 8 Power Luncheons, Education Expo registration, Think Tank (on applicable years) and QAS (Qualified Association Specialist online certificate program). The selected recipient must use the award within 12 months of the receipt of the award. (Award cannot be used as reimbursement for associated fees incurred from Jan 1 until in receipt of award) Repayment of the financial award is required if the recipient doesn’t use within the award year or fails to provide appropriate proof of award use. Grant Amount: $500 - This Grant is designed to assist an Association Executive in gaining professional development through education or training at the FSAE Annual Conference. The award will support the recipient in covering the costs of registration fees or travel expenses associated with the FSAE Annual Conference. This grant is available to FSAE members and non-members who meet the grant criteria. (For non-members, the grant will cover dues for the current membership year AND registration to the FSAE Annual Conference.) The selected recipient must use the award within 12 months of the receipt of the award. Funds can be used as reimbursement for associated fees incurred from Jan 1 until in receipt of award. Repayment of the financial award is required if the recipient does not use within the award year or fails to provide appropriate proof of award use. The Hilton Grant is generously provided by the following Hilton Partners: Bahia Mar Fort Lauderdale Beach - A Doubletree by Hilton, Boca Raton Resort & Club, Casa Marina Key West, A Waldorf Astoria Resort, Diplomat Beach Resort, Doubletree by Hilton at the Entrance to Universal Orlando, Embassy Suites by Hilton Orlando Lake Buena Vista South, Hilton Clearwater, Hilton Daytona Beach Oceanfront Resort, Hilton Fort Lauderdale Beach Resort, Hilton Miami Downtown, Hilton Orlando, Hilton Orlando Bonnet Creek, Hilton Sandestin Beach Golf Resort and Spa, Hilton West Palm Beach, Hiltons of Chicago. Thank you! Grant Amount: $600 - This Grant is designed to assist an FSAE Association Executive Member in gaining professional development through education at the ASAE or FSAE Annual Conference, or other approved Association Management Program or for training to earn the CAE or CMP. The award will support the recipient in covering the cost of fees associated with the professional development. The selected recipient must use the award within 12 months of the receipt of the award. Award can be used as reimbursement for associated fees incurred from Jan 1 until in receipt of award. Repayment of the financial award is required if the recipient doesn’t use within the award year or fails to provide appropriate proof of award use. Grant Amount: $575 - This Grant is designed to assist an FSAE Association Executive Member in gaining professional development through education or training at the FSAE Annual Conference. The award will support the recipient in covering the costs of registration fees or travel expenses associated with the FSAE Annual Conference. The selected recipient must use the award within 12 months of the receipt of the award. Award can be used as reimbursement for associated fees incurred from Jan 1 until in receipt of award. Repayment of the financial award is required if the recipient does not use within the award year or fails to provide appropriate proof of award use. 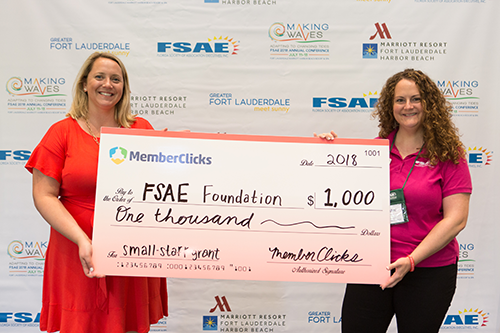 Grant Amount: $500 - MemberClicks Small Staff Grant is designed to assist an FSAE Association Executive Member in gaining professional development through educational training at the FSAE Annual Conference. To qualify, you must be a full-time employee for an Association with fewer than 20 people on staff. MemberClicks is an Association Management Software that focuses on meeting the needs of small staff associations across the country. This award will support the recipient in covering the costs of registration fees and/or travel expenses associated with the FSAE Annual Conference. The selected recipient must use the award within 12 months of the receipt of the award. Award can be used as reimbursement for associated fees incurred from Jan 1 until in receipt of award. Repayment of the financial award is required if the recipient does not use within the award year or fails to provide appropriate proof of award use. Grant Amount: Conference Registration - There are two new grant opportunities generously offered by Naylor Association Solutions. The Communications Grant is designed to assist an FSAE Association Executive Member, who has been working for at least one year in a communications, marketing or membership role, in gaining professional development through education or training at the FSAE Annual Conference. The recipient must be a direct employee of an association, not a contracted representative or vendor of an association. The recipient’s registration fee or travel expenses will be covered, and they must use the award within 12 months. The award can be used as reimbursement for associated fees incurred from Jan 1 until in receipt of award. Repayment of the financial award is required if the recipient doesn’t use within the award year or fails to provide appropriate proof of award use. Grant Amount: Conference Registration + Dues - The Naylor New Member Grant will be awarded to someone who is relatively new to the association industry, with 2 years or less experience, and who is not currently a member of FSAE or has not been a member for the past 3 years. The recipient must be a direct employee of an association, not a contracted representative or vendor of an association. The grant will assist this person in gaining professional development through education or training at the FSAE Annual Conference, and will also cover their membership dues for one year. The recipient’s membership dues and the registration fee will be covered, and they must use the award within 12 months. The award can be used as reimbursement for associated fees incurred from Jan 1 until in receipt of award. Repayment of the financial award is required if the recipient doesn’t use within the award year or fails to provide appropriate proof of award use. Grant Amount: $1,000 - These grants are designed to assist FSAE Association Executives and Associate Supplier Members in gaining the professional development needed to obtain the American Society of Association Executive (ASAE) designation of Certified Association Executive (CAE) or the Event Industry Council's (EIC) designation of Certified Meeting Planner (CMP). The grant will support the recipient in covering the cost of the application fees, study class registration, and study materials. The selected recipient must use the award within 12 months of the receipt of the award. Award can be used as reimbursement for fees associated with CAE or CMP application fees incurred from Jan 1 until in receipt of award. 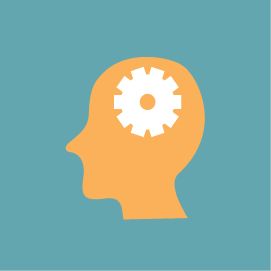 Repayment of the financial award is required if the recipient leaves the association management field within one year of receiving the award or fails to provide appropriate proof of award use. This grant is funded by member contributions to the FSAE Foundation. Thank you! Grant Amount: $500 - This grant is designed to assist an FSAE Associate Supplier Member in gaining professional development at the FSAE Annual Conference. These awards are offered to assist recipients cover the costs of the registration fee or travel expenses in getting to the FSAE Annual Conference. The selected recipient must use the award within 12 months of the receipt of the award. Award can be used as reimbursement for associated fees incurred from Jan 1 until in receipt of award. Repayment of the financial award is required if the recipient doesn’t use within the award year or fails to provide appropriate proof of award use. Grant Amount: $250 - $500 - This grant is designed to assist an FSAE Executive and Associate Young Professional Member in gaining professional development at the FSAE Annual Conference ($500) or Education Expo ($250). (Young Professionals are defined as FSAE members that are 35 years old and under or less than 3 years in the industry.) These awards are offered to assist recipients cover the costs of the registration fee or travel expenses in getting to the FSAE Annual Conference. The selected recipient must use the award within 12 months of the receipt of the award. Award can be used as reimbursement for associated fees incurred from Jan 1 until in receipt of award. Repayment of the financial award is required if the recipient doesn’t use within the award year or fails to provide appropriate proof of award use. The FSAE Foundation rewards members that contribute their time or money to FSAE, but grants are not awarded solely on merit or volunteering for our organization. Other volunteer service and financial needs are also taken into account for grant awards. 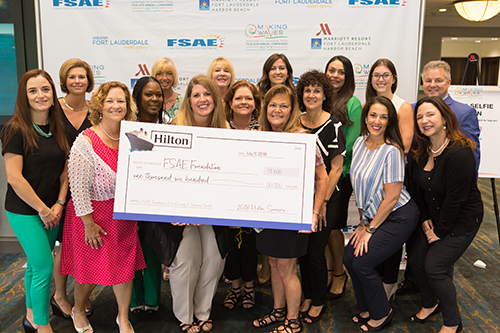 The Florida Society of Association Executives is proud to partner with Institute for Organization Management, the U.S. Chamber of Commerce Foundation’s professional development program for non-profit executives, and offer two $500 partial tuition scholarships to one of Institute’s 2019 sites. The two scholarships, available to our members, will be awarded to students attending Institute for the first time to assist with enrollment fees and cannot be combined with any other Institute scholarships. Please note, this can be combined with the Premier Investor Discount (PID) and/or Group Rate. If you are interested in this scholarship opportunity, contact Hester Ndoja, CAE, at [email protected] by February 28. The early registration deadline for Midwest and Southeast Institute is April 19th. The early registration deadline for West and Northeast Institute is May 24th. The association industry is a major professional, business and economic driver in Florida. FSAE endeavors to reach out broadly to a diverse community of professionals to assist with their professional educational and career development. Opportunities to create additional grants/scholarships to reach more members are always available. We welcome your donation to the Foundation so that we can continue the good work. For more information or to make your contribution please contact Hester Ndoja, CAE, at [email protected].